So the Salon has been buzzing with the latest treatment to be added to our menu. We placed an advert in the local ‘Down South’ Magazine with a coupon for a £15.00 saving on the lash lift treatment. Usual price £40, introductory Offer price £25! The result being I have been booked continuously every Wednesday & Thursday throughout April. It’s been lovely welcoming lots of new clients to the salon, brought in by the magazine offer, but also our regular ladies have been taking the plunge too! Many have consented to me posting their before & after pictures on social media so take a look. 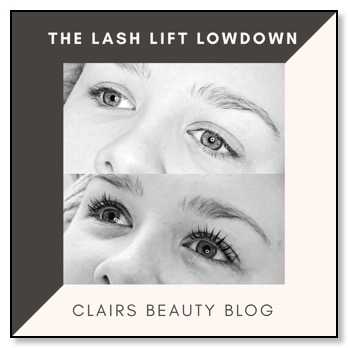 So “what is a lash lift”? I use little shields on your eyelids to hold your lashes in a ‘maximum curled’ position, much to the look post applying layers of mascara or using curlers. I then treat the lashes with different serums, lotions & conditioners. The treatment is non invasive, it’s not painful or uncomfortable, you just need to keep your eyes closed during the treatment, but I make sure you are completely comfortable with the eye shields and protective under eye pads before I start. The serums, lotions & conditioners make the lash hairs playable and I can mould their new shape and then set it and condition them. “How long does it take”? I allow a full hour for the lash lift treatment, but it takes about 40mins. I include time for consultation, checking any contraindications and assessment of the clients eyelashes. “How long does it last”? I give a 6 - 8 week guide, it depends on your own lash growth cycle, you may get longer? From your baby new lashes to grow to the end of their life and drop out is a full ‘lash cycle’. The lift doesn’t drop, they are permanently moulded, it’s when they have dropped out and new ‘straighter’ lashes take their place. Unlike the old fashioned lash perms of the 00’s, you don’t have to wait a full lash cycle for another treatment, these products are not as harsh on your lashes as the old lash perm. Appointments are only available with me (Clair), so lash lift treatments can only be booked in on Wednesdays or Thursdays, although I am doing some extra Fridays in May & June! (I’ll list the dates under the blog post). You will need to have a skin patch test prior to your appointment, at least 24 hours. You can have your skin test weeks in advance, you can have a skin test even if you are unsure about booking and just want to see how you get on with the products, having a skin test is no commitment to having to book the treatment so don’t worry, just pop in the salon and the patch test takes literally two minutes. Nope! You don’t need to return to the salon for ‘top ups’, your lashes are good to go! Perfect for holidays, and being makeup free! Just follow the aftercare of keeping them dry for 24 hours and use your little brush in the mornings in case they’re a little fuzzy from sleeping. If your looking to boost your own lashes and brows, we sell a 10ML serum for £7.50 which conditions your lashes and brows. It’s not essential, but those who have ever ‘over plucked’ their brows could definitely benefit ha ha! “What do I get for my money”? Good question, you get your lash lift treatment worth £40, you also get a FREE lash tint worth £7.50. You get a little spooly brush to brush your lashes with at home to keep them in check. Also a complimentary set of collagen eye mask pads to treat your under eye area after your treatment (after 24 hours). I feel this is a great little extra when your at home and want to freshen your delicate under eye area. All in all your getting £50 worth of beauty for £25 if you grab one of the coupons from the DownSouth magazine. “When does the offer end”? The magazine coupons expire the end of May, so be quick! We always have a stack of them in the Salon, so grab one when you get your skin patch test or you can download the voucher online! Now am going to begin with saying that hair is all good! If you have facial hair and are rocking it, keep doing what you're doing, We are all about the Frida Kahlo confidence vibe here! For those looking for options, hopefully this quick guide might be of some help. Many ladies struggle with this, due to hormonal changes amongst many other reasons. Removal usually falls into two categories : painful or expensive! 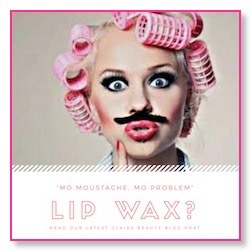 We love lip-waxing at Clair’s! Feeling confident about your appearance is our top priority and we love to provide that feeling. We aren’t just talking dark lip hairs here, about 80% of woman have fair ‘down hair’ which is unnoticed for the majority of the time. But when on holiday in the sunshine or applying makeup, it becomes visible... then we all freak out ha ha! After a lip wax your makeup practically glides on! This is tempting, quick easy, cheap as you have the equipment at hand. Disadvantages are that the hair will grow back like stubble, most likely to be thicker and darker than before. Once a regime of shaving starts, it’s hard to break the cycle. Same as above, quick and relatively easy to do yourself at home. The regrowth of the hair is the same as shaving unfortunately, as it’s not removing the hair from the root, just taking back to the surface of the skin. Also keep in mind that the chemical is harsh enough to disintegrate a hair, then what is it doing to your skin??! Ouch! Major disadvantage here is the pain factor. Removing individual hairs maybe tolerated for one or two stray hairs but removing a patch is going to prove traumatic for the skin. Threading is essentially ‘mass plucking’, (*controversial, soz) the advantage is that the hair is removed from the root, meaning it will grow back fine and not like the stubble from shaving. “Painful but necessary” is the name of the game with electrolysis for permanent facial hair removal. It takes time and endurance but is affordable. Not as popular now as laser treatments are over taking in the permanent hair removal market. Advantages are that you will be hair free at the end of the coarse! Disadvantages are that it’s expensive and works particularly well on dark course hair, ie bikini or leg hair etc, so if youre looking to remove blonde facial hair, you may need more sessions or find a specialist in this area. I have left this treatment till the end to explain in full. Traditionally waxing was done with ‘warm wax’ and removed with a strip. We use ‘hot wax’ which is removed once the wax has hardened straight from the skin, no strip or ripping motion. The skin is first prepped with a special oil so the wax sticks ONLY to the hair and not to the skin. Waxperts wax is the best wax on the market and is the closest thing to pain free. It’s gentle and we even offer an extra gentle wax which is perfect for blonde/red/grey hairs. The hair is removed from the root so grows back light and fine. The area post wax is a lot less red than other waxing treatments, meaning you can carry on your day without having to go home and smother your lip in cooling cream. For the whole of March & April we are offering a FREE Waxperts lip wax for you to try for yourself. Book for your eyebrows and get your lip done for free, we are so confident that you will love this and even if you aren’t sure, just give it a go, it’s free! Ha ha. We have Waxperts original hot wax & the rose wax for extra sensitive and fair hair. As featured on our OFFER OF THE MONTH page. So in January we decided to try something new & signed up to Candy Coats #SubBox! 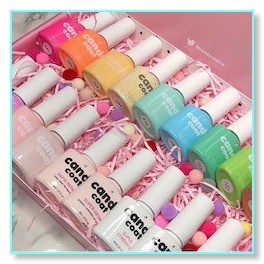 This is a monthly subscription where Candy Coat will send us a surprise box of goodies including a few different gel polishes each month. This is great way to have to limited edition colours on our shelf and be able to offer colours we may not have chosen ourselves, pushing us and our clients out of our comfort zone! We are still a CND Salon and will be continuing using shellac, this Candy Coat is like Shellac’s more fun sister! Ha ha offering fresh ideas with cats eye, glitter & heat changing ranges, to compliment our shellac range, not to replace it. So what is Candy Coat? They are a British company, (so that’s another reason I have chosen to support them in the nail industry), and recently they have had a boom in marketing. You will start to see them featured in fashion magazines this year as they were a huge part of London Fashion Week. They have an absolutely massive colour range and a some extra products I am excited to try such as hardening base layers for people who have soft or damaged nails to give their gel polish a boost. Check out Candy Coats Instagram for some #NailInspo and check outer social media to see what fun products & nail treatments we will be launching this month. So the big news is we are now officially a Waxperts salon! What does this mean? Well, it means we now provide the number 1 waxing products in the industry. We have recently retrained at the academy and upgraded our waxing menu. Waxperts original hot wax contains lavender & other anti-inflammatory properties to ensure the waxing procedure is as painless as possible, also reducing the skin redness post treatment. Its designed for the most sensitive skin, Waxperts is a successful Irish company who started developing a wax for very fair clients. There are no strips applied to the facial, underarm or bikini area, thus meaning no painful "ripping" action. The skin is cleansed and primed with an oil which ensures the wax sticks only to the hair, and not to the skin. The focus is to minimize skin irritation to virtually none. So what is 'Hot Wax'? Its a flexible wax which is peeled off, it shrink wraps around the hair and lifts it up from the follicle and simply peels off. Suitable for facial, underarm and bikini waxing. Great for sensitive skin! Waxperts also do a strip wax for larger areas such as legs and arms. We are so confident that you will love this new super professional waxing service, that you will never go back to traditional waxing, hair removal creams or threading ever again. 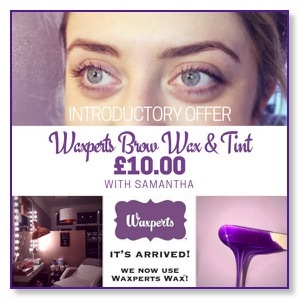 If you fancy trying our new wax, take advantage of our 'Waxperts Brow Wax & Tint' introductory offer. Download our voucher for just £10.00 instead of £14.00. Offer finishes end of Feb but you have till 31st March to use your voucher. *You can buy multiple vouchers, just must be redeemed by 31st March 2018. Our facial waxing menu is available online, we also have our gorgeous Waxperts ROSE GOLD wax too, which is perfect for extra sensitive clients! Our bikini and body waxing menu will be launched soon, so stay tuned and get ready for summer!